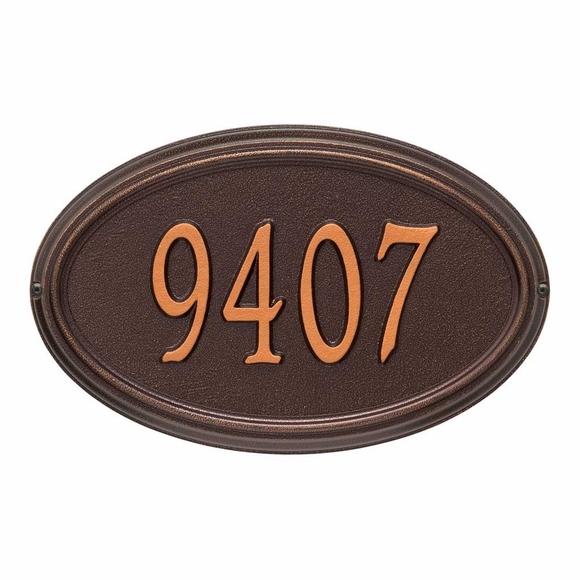 Concord Oval House Number Plaque - - personalized oval address sign holds up to four (4) 4" numbers. Wall mount or lawn mount with purchase of optional lawn stakes. Made in USA. Timeless design with raised border and classic lines. Metal sign crafted from rust-free recycled aluminum. Large image shown in antique copper. Smaller images (from left to right): black/gold, black/silver, bronze/verdigris, oil rubbed bronze, bronze/gold. Dimensions: 15"W x 9.5"H x 0.375. Concord Oval House Number Plaque personalized oval address sign. Made in USA.